If you want to prevent the curious hands of children, neighbors, employees, or opportunistic sneak thieves, from getting to your handgun while you still have easy access for emergencies, this safe could be perfect for you. If you have long guns, multiple guns, or are expecting an attack by criminals with power tools, a pick axe, and perhaps a sledgehammer or two plus an uninterrupted period in which to access your gun, then you might want to continue searching for a different safe. • A foam-lined interior that gently cradles your firearm while an 18-guage steel exterior deters all but the most well-prepared intruders. The exterior design allows little to no access for inserting prying tools. Some people complain that the steel feels thin, but its thinness disguises its strength. Someone with only hand-tools will have a tough time opening this safe before they are caught. At 13 inches tall, 6 ½ inches deep, and 3 ½ inches wide, this safe is compact enough to fit into most spaces in a home or business where you might want to install it. The included mounting hardware fits on the left, the right, or the rear of the safe for numerous mounting options that don’t block the safe-door. Once installed, you must open the safe to get access to the mounting screws. and in many other locations using the supplied hardware alone. Other owners suggest adding longer screws than those supplied or perhaps using the supplied hardware to attach one side plus screwing through the back panel in a corner location to strengthen the installation. A digital keypad provides entry to the safe. Using the 4 buttons, you create a series of “entries” (each entry is the pressing of either 1 button, or more than one button pressed at the same time), and you need between 3 and 6 entries to make a complete code. Once the code is entered correctly, the motorized latch unlocks, the door drops open, and an interior light comes on. The interior protective foam is constructed so that the grip of the gun remains uncovered for easy drawing, and you are ready to go. If you fail to enter the correct code within 24 button pushes access is prevented for two minutes. This safe is fitted with both audio and visual alarms. These come in the form of a “beep” and an LED that flashes either red or green. The alarms sound/flash when the keypad buttons are pressed, when the door opens, and when incorrect entries cause a lockout period. The latter “tamper alert” lets you know if someone unsuccessfully tried to gain access. When you press a button the alarms will warn you if the 9-volt battery (not supplied) required to operate the motorized latch, the interior courtesy light, and the digital keypad is low on power. As mentioned earlier, the decision whether to buy this gun safe rests very much on your reason for buying it. • It is for handguns only. • It is for one handgun only. • It is not designed for assault by highly knowledgeable and highly determined individuals with unlimited time and unlimited access to a variety of power tools. 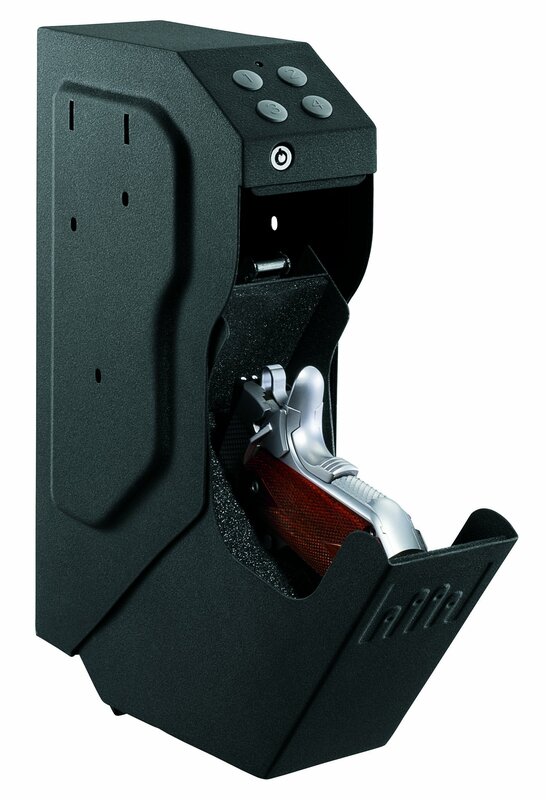 But if you want a secure, affordable, and adaptable solution for securing a single gun in your home or your business, then this may be the one for you. Most criticisms arise from unrealistic expectations, criticisms about strength or size compared to cost and expected use. Obviously, someone with a sledgehammer could knock this off a wall and carry it away to be opened later. But are you really going to install it where this is likely? Probably not. No, you probably want this close at hand, where you can draw as soon as you hear an intruder, perhaps in your bedroom or office. Other criticisms tend to be a bit nit-picky . . . The noise of the motorized latch is too loud. The beep of the alarm is annoying. The courtesy light is too bright, etc. You can turn these off if you really need to. But in an emergency situation are these really problems? Finally, rather than a criticism this is probably just sound advice: depending on your code and the combination of buttons you have to press, you may want to practice entering the code. Practice enough to make it second nature. The buttons are large and the rubberized surface has raised numbers for easy identification, but if your code contains simultaneous button pushes mistiming those button pushes may cause an incorrect entry. A few people have mentioned this, so practice is probably a good idea. Overall, for cost and purpose, the benefits of this gun safe easily outweigh the problems, but it cannot be stated enough . . . consider where and why you are going to use this product before buying.